House prices in Sydney, Melbourne and Perth are set to continue their steep falls before a possible modest rebound in prices later this year or early next, Moody’s Analytics predicts. 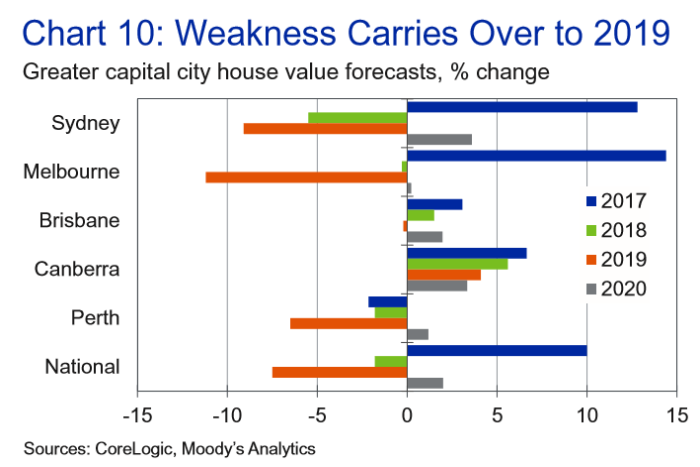 Nationally, Moody’s expects house prices in capital cities to fall 7.7 per cent this year, having declined 1.8 per cent last year, while units are tipped for a smaller 4.3 per cent decline in 2019. Unlike last year, Melbourne is forecast to lead the price slide, with an 11.4 per cent slump in house prices tipped and a smaller 5 per cent slide in apartment values. But the average for greater Melbourne hides regional differences, with house prices in the inner-east (-16.3 per cent) and inner-south (-14.2 per cent) expected to fall further than houses further from the city centre. While apartments are not expected to fall as much in the short-term, the analysts at Moody’s expect declines in some regions to continue for several more years, with cumulative falls in Melbourne’s south-east and west expected to reach 16.6 and 18.8 per cent by 2021. Melbourne’s house price rebound is also expected to take longer, starting in mid-2020. In contrast, Moody’s expects Sydney prices to bottom out in the September quarter of this year, before staging a moderate recovery in 2020. The analysts are tipping a 9.3 per cent fall in house prices and 5.9 per cent slide in unit prices over 2019, before a 3.6 and 4.2 per cent rebound respectively in 2020, with price growth to pick up further in 2021. The biggest falls in house prices are expected to continue being in the Ryde area, with a 15.8 per cent fall tipped in 2019 after an 11.3 per cent slide in 2018. The biggest dips in unit prices are forecast for the outer south-west and Sutherland districts, at 10.7 and 9.1 per cent respectively. The outlook also remains weak for Perth, where both house and apartment prices are expected to fall roughly 8 per cent further, having been in decline for several years already. Darwin apartments aside, where a further 13.1 per cent slump is tipped for 2019, the other capital cities are generally expected to have relatively flat property prices. Hobart’s run of price gains is tipped to end next year with small house price falls over 2020 and 2021. The analysts from Moody’s said lending conditions have been a key factor in the housing correction, especially in Sydney and Melbourne. “An important driver of the slowdown in Australia’s housing market has been tighter credit availability, partly as a consequence of the regulator — the Australian Prudential Regulation Authority — tightening lending conditions, which has made it relatively more difficult to purchase a property, particularly for investors,” they wrote. “The recently concluded Banking Royal Commission Into Misconduct in the Banking, Superannuation and Financial Services Industry could exacerbate already tightened lending conditions, which could result in a further slowdown in credit availability, particularly in the investor portion of the market. But this threat appears to have been averted, with the commission declining to recommend further responsible lending restrictions, leaving the interpretation of the current rules up to the regulator and a case against Westpac currently in the Federal Court. Another potential handbrake on a near-term rebound in the market is Labor’s plan to abolish negative gearing on existing properties for new investors, while grandfathering the tax break on those homes already owned prior to the announced implementation date of January 1, 2020. “If this policy were implemented within the first year of the Opposition entering office, already-slowing conditions in the investor segment of the market would be exacerbated,” the Moody’s analysts wrote. “Investors have been relatively more impacted than owner-occupiers in the past three years amid tightening of lending conditions that has contributed to the slowdown in home values. The home value forecast report was written by Moody’s Analytics, which operates separately of the Moody’s Investors Service credit rating agency. 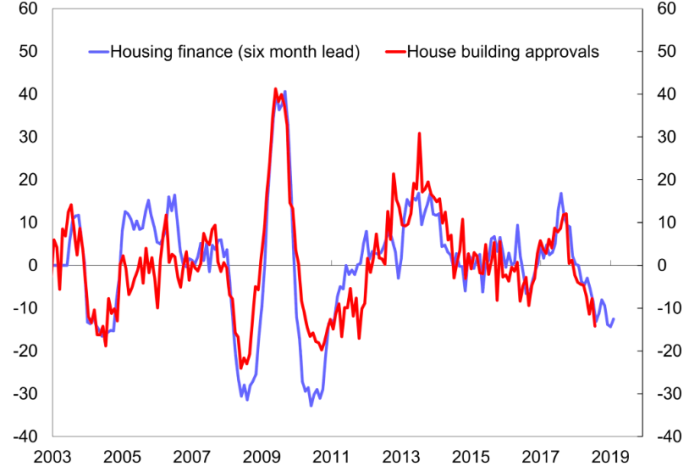 Meanwhile, figures released by the Australian Bureau of Statistics hint that Australia’s housing downturn may have passed its peak rate of decline. The total number of owner-occupier home loans being taken out in February rose 0.8 per cent, with the value of loans in this segment up 3.4 per cent on the previous month. Owner-occupier home loan approvals are still down 12.5 per cent year-on-year. Likewise, lending to property investors rose 0.9 per cent in February on the previous month, but was still down 29.1 per cent over the past year. Citi economist Josh Williamson said there were early signs in the data that “the trough could be approaching”. “In yearly percentage change terms, housing finance approval values are still declining but the pace of decline may have peaked,” he said. Other analysts are less optimistic. “Overall, the February update was a little firmer than expected, consistent with the improved tone from auction market activity and a slowing in price declines in recent months,” Westpac’s Matthew Hassan said. “Some of the effects of tightening credit conditions may also be dissipating.